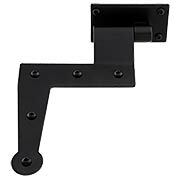 Our authentic Connecticut-style shutter hinges are easy to install and maintain. 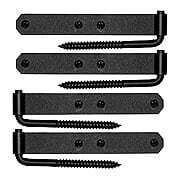 The straight straps are mounted on simple, L-shaped lag bolt pintles that drive directly into the window surround or masonry. Made of heavy-duty stainless steel, the smooth surface is phosphate treated then lacquered, for rust-resistant, long-lasting wear. Designed to be visible when your shutters are open, these traditional tapered strap hinges are perfect for colonial or other rustic home styles. Made of heavy duty wrought steel with a durable baked enamel finish, they're sturdy enough to carry large and heavy shutters. Use these traditional style shutter straps to replace worn or missing parts, or to build shutter hinges for your specific needs (mounting pintles sold separately). Designed to work with 1/2" diameter pintles, they have zero offset. Made of powder coated stainless steel. 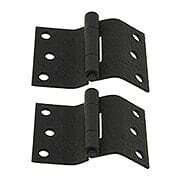 Use these traditional style shutter straps to replace worn or missing parts, or to build shutter hinges for your specific needs (mounting pintles sold separately). Designed to work with 1/2" diameter pintles, they have a 1/2" offset. Made of powder coated stainless steel. 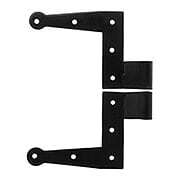 Use these traditional style shutter straps to replace worn or missing parts, or to build shutter hinges for your specific needs (mounting pintles sold separately). 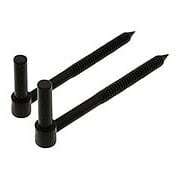 Designed to work with 1/2" diameter pintles, they have a 2 1/4" offset. Made of powder coated stainless steel. With a 3/4" offset, these traditional arch-top pintles work well with wood or stucco homes with flat window trim. 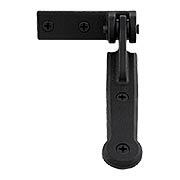 Use them to replace worn or damaged pintles or to build your own custom sized shutter hinges (straps sold separately). Made of heavy duty stainless steel which is powder coated black. With a 1 3/4" offset, these traditional arch-top pintles work well with brick veneered homes. 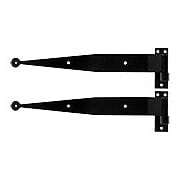 Use them to replace worn or damaged pintles or to build your own custom sized shutter hinges (straps sold separately). Made of heavy duty stainless steel which is powder coated black. With a 2 1/4" offset, these traditional arch-top pintles work well with brick homes or homes with extra thick window trim. 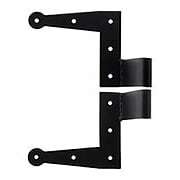 Use them to replace worn or damaged pintles or to build your own custom sized shutter hinges (straps sold separately). Made of heavy duty stainless steel which is powder coated black. Sturdy and versatile, our 4-Inch Lag Bolts are designed for masonry or wood applications. They feature a variable offset and a 1/2-inch diameter, which fits our matching L straps (sold separately). 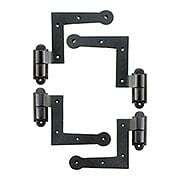 Made of heavy-duty stainless steel with black powder coating. Length from end of lag to center of pintle rod is 4 3/4-inch. The lag bolt is 3/8-inch in diameter. Sturdy and versatile, our 6-Inch Lag Bolts are designed for masonry or wood applications. They feature a variable offset and a 1/2-inch diameter, which fits our matching L straps (sold separately). 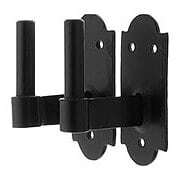 Made of heavy-duty stainless steel with black powder coating. Length from end of lag to center of pintle rod is 6 1/4-inch. The lag bolt is 3/8-inch in diameter. With a 1 3/4" offset, these narrow pintles work well with brick veneered homes. 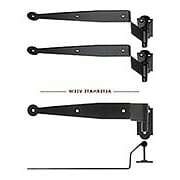 Use them to replace worn or damaged pintles or to build your own custom sized shutter hinges (straps sold separately). Made of heavy duty stainless steel which is powder coated black. 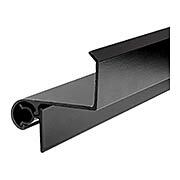 With a 3 1/4" offset, these narrow pintles work well with brick or stone houses. Use them to replace worn or damaged pintles or to build your own custom sized shutter hinges (straps sold separately). Made of heavy duty stainless steel which is powder coated black. New York style strap hinges are one of the most stylish and practical ways of hanging your shutters. 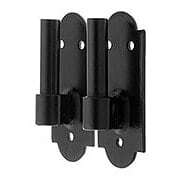 This set of four hinges has a 1 1/4" offset (2 1/2" throw), which is ideal for most wood framed houses. Hand forged from heavy duty steel, they're galvanized and powder coated to resist rust. New York style strap hinges are one of the most stylish and practical ways of hanging your shutters. 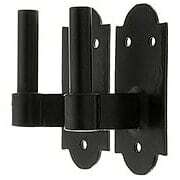 This set of four hinges has a 2 1/4" offset (4 1/2" throw), which is ideal for most brick houses. Hand forged from heavy duty steel, they're galvanized and powder coated to resist rust. Authentic colonial style and a rough black finish make these classic New York strap hinges a great choice for period restorations. 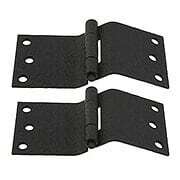 These very sturdy hinges lift off for easy maintenance and have a 1 1/2" offset (3" throw). 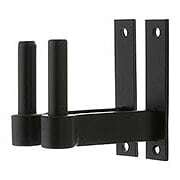 Made from 1/4" thick cast iron, they are powder coated to resist rust. Authentic colonial style and a rough black finish make these classic New York strap hinges a great choice for period restorations. 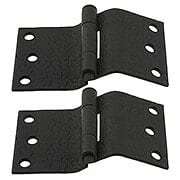 These very sturdy hinges lift off for easy maintenance and have a 2 1/4" offset (4 1/2" throw). 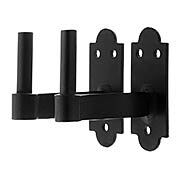 Made from 1/4" thick cast iron, they are powder coated to resist rust. Our sturdy Bean-Tip Shutter Strap Hinges combine Colonial-style with modern, stainless-steel construction. The surface is phosphate treated then lacquered, for rust-resistant, long-lasting wear. 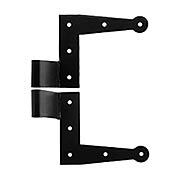 Reversible for right or left-handing, they are easy to install and maintain. 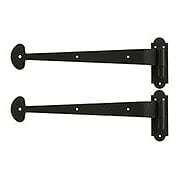 Pair of Forged Iron Offset Mortise Shutter Hinges - 4" x 3"
These full-mortise shutter hinges have a unique curved offset that allows you to throw the shutter clear of the window. Made of heavy-duty forged iron with a rough textured surface, they are a great choice for Colonial or Romantic style homes. The surface is phosphate treated then lacquered, for rust-resistant, long-lasting wear. Pair of Forged Iron Offset Mortise Shutter Hinges - 5" x 3"
Pair of Forged Iron Offset Mortise Shutter Hinges - 6" x 3"
Use these traditional style shutter straps to replace worn or missing parts, or to build shutter hinges for your specific needs (mounting pintles sold separately). Designed to work with 1/2" diameter pintles, they have a 1 3/4" offset. Made of powder coated stainless steel. With a 3 1/4" offset, these traditional arch-top pintles work well with brick or stone houses. 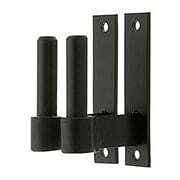 Use them to replace worn or damaged pintles or to build your own custom sized shutter hinges (straps sold separately). Made of heavy duty stainless steel which is powder coated black. Colonial style shutter hinges for your new home! 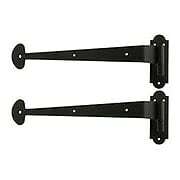 These hinges are powder coated black and are offset mounted to fit most modern window styles. These very sturdy hinges lift off for easy maintenance and have a minimal offset and 2 1/4" throw. These premium shutter hinges are a great choice for use in coastal regions, forged from 304 stainless steel. 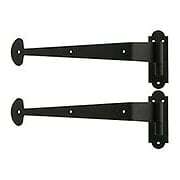 Both straps and pintles are powder coated black to give a traditional look. The hinges lift off and are reversible, making installation and maintenance simple. Made in USA.